• PLOT SUMMARY: The Flash, Wonder Woman and the JSA come face to face with their greatest foes and long-lost loved ones, newly undead as evil Black Lanterns, in this collection of three 3-issue BLACKEST NIGHT miniseries. Collects Blackest Night: Flash (2009) #1-3, Wonder Woman (2009) #1-3, and JSA (2009) #1-3. 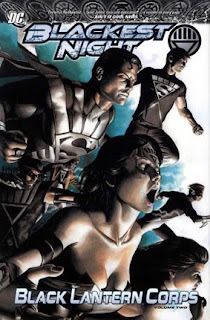 Written by JAMES ROBINSON, GEOFF JOHNS and GREG RUCKA. Art by SCOTT KOLINS, NICOLA SCOTT, EDDY BARROWS and RUY JOSE. Cover by RUDOLFO MIGLIARI. Hardcover, 256 pages, full color.